Who is this guy Saturn? Frivolity alert: I just finished writing up a summary, which was a lot like hard work, so I feel like indulging myself. This essay is going to wander rather aimlessly except for the title character, and there will be no references. Let’s start with my favorite painting. It is by the Spanish painter Goya, and hangs in the Prado museum in Madrid. The painting is very big. It is wide and disproportionately tall. Most of it is tan with subtle variations. Cut to a wonderful visit I had to a museum in New York with Al Murray, the renowned portrait painter. Look him up. He’s more interesting than I am. Some paintings by an English landscape artist were hanging. He waved at one and remarked that it was an embarrassment. It had just been painted to sell. It looked glorious to me. Certainly it represented a lot of work. Then he indicated another and said, “Now this is painterly. Look at the bold impasto technique. This is a great painting.” I nodded. We strolled together as I soaked up as much as I could from the master. Some he liked a great deal; others he didn’t like at all. Mr. Murray was ready to criticize paintings but I fear I went too far. He steered me into another room saying, “You’ll like these.” It was a collection of works by the French painter Fragonard. They were exquisite. Murray certainly saw through me. Look Fragonard up, too. Cut back to the Prado. That great expanse of tan. It represented nothing. It was a celebration of the paint itself. And at the bottom of the painting, totally realistic and life size was a dog, not the whole dog, just the head visible. I swear it was the same English sheep dog. It was staring up as if in wonder at the world of paint above it, although of course the dog faced forward and the paint would have been behind it. It is a commonplace in painting that if you have a picture of a face and want to make it seem intense, put the face at the top of the frame. By putting the face at the bottom of the frame Goya had accomplished a projection of peace and tranquility I have seldom felt. Yep. Guess you better look Goya up as well. 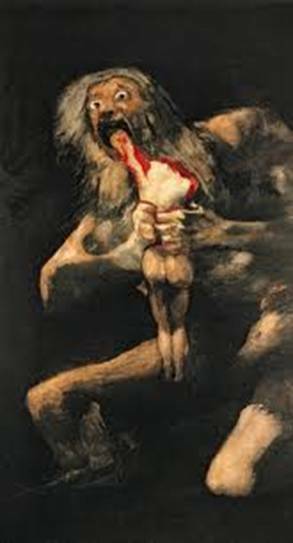 In Goya’s work there is plenty of brutality (yes, we’ll get to Saturn), but I still think he was a sensitive man. Saturn was a titan. The titans are all but forgotten. Look him up and you will read that he was a god. But he was not. The gods represented abstraction, like the sun of course, but Apollo was also god of music and clarity of thought, god of cool observation and reflection. Dionysus was god of theatre and revelry but also of plunging right into things. These two divided the year with the warm months being those of enlightenment and the winter months being the time of holidays and madness. Saturn was the father of the gods. So thought was not his strong point. Even the abstraction of madness did not exist in Saturn’s prime. His psyche was something more primitive than madness. Now Saturn is presented as “god” of wealth, of freedom, of equality, of time and of peace. Those are late modifications. If you look earlier for wealth you get extravagance. For freedom and equality you get chaos. For time you get destruction. For peace you get the underworld. He is associated by some with human sacrifice. And he did one thing most notable. He ate his children. This was not an entity you would want to have anything to do with. The word “saturnine,” meaning gloomy, comes from the name. In fact if you drop the “r” from the name, and people often drop that letter, you come up with something that sounds a lot like Satan. And Goya painted a picture of him. The face is close to the top of the frame, just in case the rest of the picture is not intense enough for you. Look at the eyes. You have seen those eyes recently. Two tragedies this year were perpetrated by men who had those eyes. They are beyond evil, beyond insanity, beyond any abstraction. You have to wonder where Goya saw those eyes. The power is enormous. That’s a god he’s eating. Cut to southern Mesopotamia a long time ago, when the Babylonians are watching the sky. It’s a clear night because it’s a dry climate and their obvervation is above the glare of cook fire. The view is spectuacular of course. The night sky always is if you ever get a good luck at it. They have noticed of old that there are thousands of fixed starts but only seven lights in the sky that move, the wandering stars or planets. Yes of course there are meteors and comets, too. But they take a particualar interest in their planets. Their numbering system is based on twelve or some multiple, and they divide the dayly cycle into 24, hours, a convention we still understand. They named the hours after their favorite things, the wanding stars. The order was, if my doodling is correct: the sun, Venus, Mercury, the moon, Saturn, Jupiter and Mars. I see no logic in the order and I doubt there was any. It was arbitrary. They weren’t assigning personalities to them, much less divinity. The lights were just what they studied. And I guess they got paid pretty well. Astronomers generally do. When they got to eight in the morning they notice they were out of planets, so resourcefully they started using the names over. That means that the second day didn’t begin with the hour of venus; it began with an hour of the moon. Here is my attempt to sort it out. Hours are on the vertical axis. There are 24 of them. Then they repeat in the next column. The names of the first hours of seven days are across the top. Well that seemed nice enough so they named the days after the first hour, sun day, moon day and so forth. Thus they invented the week, which we still find to be a convenience. The Babylonians had their pantheon of gods, but they were heroes and heroines of ancient tales, not lights in the sky. Cut to the Old Testament. There have been holy annual holidays as far back as one can find relevant evidence and surly eons before that. But scripture does a novel thing. It establishes a weekly holy day. Of course the people involved knew one way or other of the Babylonian tradition, else they could not have known about the week. And the choice was made for Saturday to be the holy day of the week. Oh, oops. Oh, very much oops. That’s Saturn’s day, isn’t it? According to scripture that’s to be our holy day. Christians chose the friendly day of the sun. It was the day of the resurrection and the early Christians were quite familiar with Saturn in his cthonic as well is in his presentable modes. And they didn’t like anything that might have to do with the antichrist. That feeling long persisted. As a boy growing up in the south I found that the time for parties was Friday night. That’s the day of Venus. That’s good enough for looking for love. Saturn was ill omened, although nobody ever mentioned it. It just wasn’t a good day to start things. Sailors said Friday was an unlucky day to start a voyage. They didn’t want to miss a Friday night ashore. Do not accuse me of mixing cultures, Hebrew and Greek. The Greeks had been paddling around the Mediterranian Sea since the stone age. They were great traders. You couln’t sneeze without a Greek merchant stepping up and offering to sell you a hankie. All right. I told you I didn’t have any references. Of course the Hebrews knew the Greek take on Saturn. Cut back to the early Christians. Trying to make converts to Christianity was a tricky career choice for a time in ancient Rome. You could get thrown to the lions, depending on who the emperor was. You’d be better off handing out Bibles in the streets of Tehran today. But they wanted to celebrate Christmas. The obvious thing to do was to choose a time when everbody else was celebrating. They chose the Roman Saturnalia. Oh, dear me. Oh, I don’t like where this is going at all. Christmas is timed not just to correspond with a pagan holiday, it’s timed to coincide with Saturn’s holiday. Cut forward to the Dark Ages. Rome has fallen. Europe is almost back to Neolithic times, worshiping the old pagan gods again, fighting with wild abandon. Muslims have swept from their Arabian homeland to the Atlantic in one direction and the Pacific in the other. China is haning in there. And in Europe there is a single power that might face them. The Muslims already hold Spain and have entered France. Constantinople is still strong but will eventually fall. Then they will be stoped by a man named Dracula, Vlad Tepes. Known for impaling people in enormous numbers. Dracula means “little dragon,” and “dragon” in that time and place was the beast of the apocalpyse. But that will be later. If the Muslims can push across Europe they can confront Constantinople in both directions. The city will never stand. Europe will go Muslim and Christianity will be gone. And don’t think people didn’t know that. Between Spain and Constantinople there is just one effective fighting force. It is alliancs called the Franks. And the Franks defeated them. These Franks weren’t fighting to save Christiantiy. They were pagans themselves. They worshiped the old Tutonic gods. But somehow they met the invaders in battle on a field in France that nobody even knows the location of any longer. The tide turned and the Muslims were finally driven out of Spain by Ferdinand and Isabella. Then the Franks looked at what they had done. They became acquinted to writing. They were amazed. They learned about the week. And one could hear the words of men who had died centuries before. It was magic. They used the word “glamor.” From that we get the word grammar. Within a couple of generations the Franks had taken charge of all of Europe. They had established a consistent way of writing that everyone could understand. And they founded all the royal famlies of Europe. And they looked at the days of the week. The Romans, of course, associated the planets with their gods, as had the Greeks. To the Franks it seemed like the gods were being honored by having the days of the week named after them. Couldn’t have them, of course. They were loosers. Where were those Roman legions when they were needed. Besides Rome had never really conquered the Frankish homeland. So the decided to improve things. Thet kept Sunday and Monday; the sun and moon were recongized. But Mars day? No way. They put in a war god from their own pantheon so we get Tuesday. Mercury day? Personaly I would have chosen Loki, the trickster god for Mercury, but they chose Woden, king of the gods, hence Wednesday. Then came Jupiter day, and Jupiter was king of the classical gods. They named that after Thor. He wasn’t king of the gods but he was always more popular than Woden; he still is. Venus day was named after a Frankish goddess to give us Friday. But when they came to Saturn, I guess they rather liked him. So they decided to keep Saturday. Oh, well.